2 luxury rooms with quality chattels and spacious tiled ensuites (1 with spa bath). The guest rooms are located on the ground floor of our modern city townhouse. 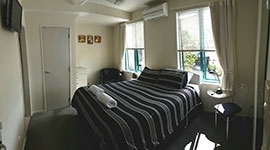 Each room is fully air-conditioned with TV, robes, iron/ironing board and hairdryer. The guest lounge is air-conditioned with Sky TV, kitchenette with microwave, tea/coffee-making facilities and fridge freezer. Free wireless internet is provided. Ideally suited for corporate travellers, enquire about our business rates. 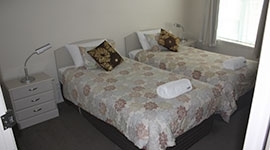 King-size bed, tiled ensuite with shower, air-conditioning, TV, robes, iron/ironing board and hairdryer. Free wireless internet included. Twin king single beds, tiled ensuite with shower and spa bath, air-conditioning, hush glass, TV, robes, iron/ironing board and hairdryer. Free wireless internet included. 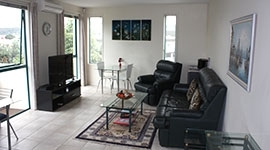 Exclusive luxuriously appointed guest lounge, with comfortable seating and flatscreen Sky TV, which opens onto deck and garden with spectacular views over the river, Town Basin and Marina. Free WiFi. Kitchenette with microwave, tea/coffee-making facilities and fridge. Off-street parking.